A conularid fossil from Crawfordsville, Illinois. Photo by Dave Smith © 2006 UCMP. Conulariids have been the subject of speculation for a century and a half. 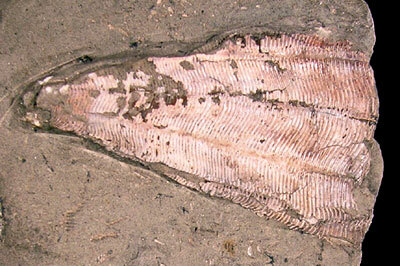 They aren't that uncommon; there are a number of genera, and they ranged from the Middle Ordovician to the Triassic. There are even a few cases in which conulariid soft parts have been preserved. Nonetheless, exactly what they were is still not settled. Because of their fourfold symmetry, they have often been placed in the Cnidaria by analogy with the fourfold Scyphozoa. However, their skeleton was very different from anything known in the Cnidaria, and they may represent a separate, extinct phylum, probably triploblastic (see Babcock 1991 for a defense of the separate phylum hypothesis, and Van Iten 1991 for a defense of the cnidarian hypothesis). What can we say about conulariids? They had elongated, pyramidal exoskeletons, made up of rows of calcium phosphate rods. Most were square or rectangular in cross section, with prominent grooves at the corners. They lived attached to hard objects by a flexible stalk, and often lived in groups. Presumably they were filter feeders; how they reproduced is not known. Babcock, L.E. 1991. The enigma of conulariid affinities. Pp. 133-143 in A.M. Simonetta and S. Conway Morris (eds.). The Early Evolution of Metazoa and the Significance of Problematic Taxa. Cambridge University Press, Cambridge. Van Iten, H. 1991. Evolutionary affinities of conulariids. Pp. 145-155 in A.M. Simonetta and S. Conway Morris (eds.). The Early Evolution of Metazoa and the Significance of Problematic Taxa. Cambridge University Press, Cambridge.